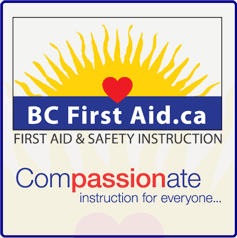 We offer internationally recognized First Aid certification courses for individuals and groups, specializing in on-site training from groups and business on the Sunshine Coast of BC. For more information about these or any of our courses please don´t hesitate to contact us. These Courses are designed to provide essential skills to interested Good Samaritans (volunteers, families, etc...) who are interested in first aid but do not require a workplace first aid certification. First Aid & CPR training is mandatory for some employees in the workplace (Occupational First Aid formerly known as Industrial First Aid). These courses have been specifically designed to meet special workplace requirements, however the skills and knowledge are also applicable to everyone´s daily life. First Aid training specifically focused for child care workers. As with all first aid courses the skills and knowledge have relevance for every day life but the scenarios and topics have been geared specifically for child care. Seafarers require specific training in first aid as mandated by Transport Canada. These courses focus more on the hazards of the marine environment. Wilderness & Remote First Aid & CPR is for individuals who recreate or live in isolated or wilderness settings and need to respond to emergencies when advanced care is not immediately available.